We collect and share here the newest codes we find to use with Tracfone that are working in September 2015. Here at http://stephaniefulke.blogspot.com /">TracfoneReviewer we want to help everyone get the free bonus minutes, so we make a simple list of codes below. Tracfone is a prepaid wireless cell phone company in America that provides both cell phones and cell phone service. You buy airtime cards to add service to your phone, and you can also use a promo code for additional free minutes. These promo codes have various amounts, from 20 to 300 free minutes, depending on which card you are using with it. Promo coupons or codes generally are for a certain airtime card, like a 200 minute card, or for any card of greater value. Promo codes do not work for http://stephaniefulke.blogspot.com /2014/07/tracfone-android-list.html">Android Tracfone Devices or for the http://stephaniefulke.blogspot.com /p/tracfone-byop-phone-list.html">BYOP program, but you can follow those links to learn more about the many smartphone options available with Tracfone. To use a promo code, the best way is to either go online to the Tracfone website, and click on add airtime, and then follow the steps. Be sure to add your promo code when you enter the airtime PIN. You should get a few chances to try different codes. You can also call Tracfone and have them add your airtime, and this also allows you to enter a promotional code. The list of codes below are selected because they have been tested and are working for this month. But if you're looking for more options, visit our full http://stephaniefulke.blogspot.com /p/tracfone-promo-codes.html">Promo Code Page where we share all the various codes. And don't forget to check the comments for additional help from other visitors. Well, let's take a look at the bonus codes! Each code is for a certain airtime card, or any card of greater value. Remember that these codes won't work on Smartphones with Tracfone. 1 Year/ 400 Minute Card enter 47125 to get 250 additional minutes free! These are the top codes to use this month with Tracfone. Let us know in the comments which code is working for you! If you're an Android user, or just curious, take a look at our new post on http://stephaniefulke.blogspot.com /2015/08/how-data-works-on-tracfone-android.html">How Data Works for Android Tracfone Devices. It also includes an analysis of which data card is the best value, and how they compare to regular airtime cards. We also recently updated our list of the http://stephaniefulke.blogspot.com /2013/07/best-lg-phones-from-tracfone.html">Best LG Phones with Tracfone, so take a look! And if you're in the market for a new phone, see our recent list of http://stephaniefulke.blogspot.com /2015/08/tracfone-sales-and-discounts-list.html">Tracfone Deals and Sales. Thanks for visiting and we hope these codes work for you! we feel the information Tracfone Promo Codes for September 2015 that's all. hopefully the information Tracfone Promo Codes for September 2015 that we have conveyed can provide benefits for you and all visitors of this blog, if any criticism and suggestions please comment. 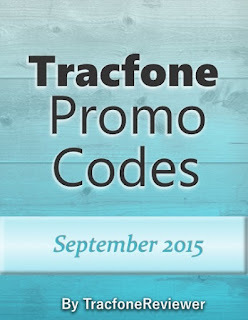 you just read Tracfone Promo Codes for September 2015 if this article is considered useful and you want to bookmark and share it please use the link https://stephaniefulke.blogspot.com/2015/09/tracfone-promo-codes-for-september-2015.html and what if you want other information look for another page in this blog.